I grew up with snakes. In the desert wilderness of southern Nevada, pit vipers (in the form of rattlesnakes) were common even our backyards. 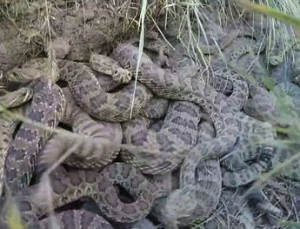 Rattlesnakes can be dangerous, but they are also cowards. A rattler prefers to remain motionless, hoping not to be noticed. If you come too close and corner it, it will rattle a warning and stand its ground. But rattlesnakes never pursue people; they would rather flee than fight. They prefer to “flee the wrath to come;” make them aware that you’re coming and they will slither away as quickly as they can. Who are the vipers today? Back then, it was the religious leadership and not just those of one “party”. John addressed himself to both Pharisees and Sadducees, both the “right” and the “left” of his day. Could it be that today’s “brood of vipers” are the leaders of the churches? Could it (in my own denominational tradition) be all of the bishops and leaders of the Anglican Communion who have spent too much time tangled up, hissing and rattling at each other about issues which truly are adiaphora to the Gospel of Jesus Christ? Or could it be that John was bemoaning the Sadducees’ and Pharisees’ role as political rather than religious leaders? Are today’s vipers the politicians who lead this and other countries? Political leaders whose concerns seem to be everything but the well-being of the people they are supposed to govern? Political leaders whose every action seems focused on everything but the Constitution’s commission to work for the betterment of the union, of justice, of domestic tranquility, and of the general welfare? Could it be that John’s complaint was not that the Sadducees and the Pharisees were corrupt or evil, but that they were distracted and wasting their time and effort, that his ire was worked up because rather than be about the work of God they were too busy wrangling with one another over that which was extraneous and immaterial to that work?